The Lokad Forecasting extension enables you to create ad hoc business forecasts directly from within Strata using time-series data. This extension utilizes the Lokad forecasting web service, which uses advanced algorithms to generate forecasts with better accuracy than traditional forecasting methods. Forecasting is an important part of business, whether predicting future sales volume, inventory levels, cash flow predictions or, really, just about any type of future occurrence that has historical data associated with it. Very large companies, in particular, may have a department dedicated to this task with automated reports coming from their ERP system. Other companies may perform forecasting on a regular basis, as business operations dictate (say, a retailer forecasting replenishment orders). This extension enables you to create your own ad hoc forecasts directly from Strata, using Lokad’s technology. This plug-in is ideal for those who need to perform forecasts on an ad hoc basis with different data sets. In particular, this extension can benefit consultants that produce forecasts for their own clients, sales analysts who do not have adequate forecasting from their OLAP systems and financial departments interested in different cash flow forecasts, among others. A Lokad login and password is required to use this plug-in. The Lokad service is available free for 30 days. Full information on the free trial and pricing can be found here. 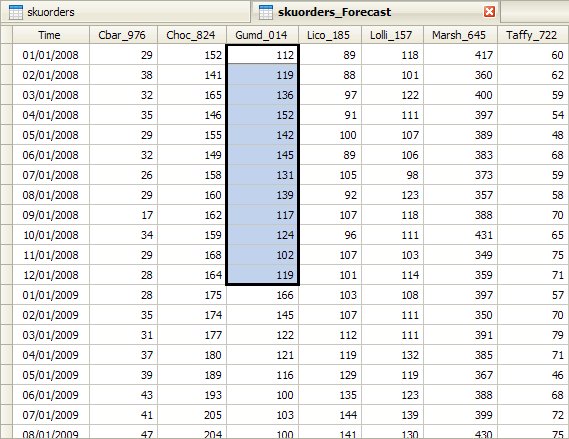 After installing the extension, select “Lokad Forecaster” from the Tools menu to open up the dialog. 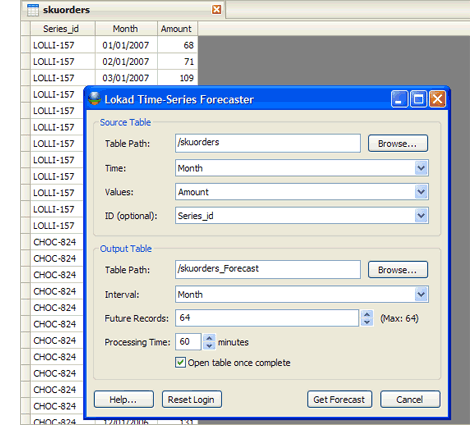 If you have a table already open, the Lokad Forecaster will attempt to pre-populate the dialog boxes with proper information. — Table Path: Enter the path of the historical data table for your forecast. Please note that Lokad limits the uploaded data set to 25,000 records. — Time: Enter the field that corresponds to the time value. — Values: Enter the field that corresponds to the value or amount. — ID: If you have multiple time-series, enter the series identification field. — Table Path: Enter the path name for the table that will be created. — Interval: Select the interval you’d like to receive in your output table. The output interval does not need to be the same as your input interval. — Future Records: The number of forecast records, based on the interval you set up. — Processing Time: The number of minutes you’d like to wait before receiving your forecast. The longer the delay, the more processing that can be done in Lokad and the more accurate your forecasts will be. 60 minutes is generally a good middle ground for most data sets. — Open table once complete: Check this box if you want the forecast table to open up immediately upon completion. If this box is left unchecked, the table will appear in the project tree for you to open manually. When you have finished entering in your criteria, select the Get Forecast button to run the forecast. If you have not saved your Lokad login and password, a dialog will appear asking for this information. Enter the login and password and then click OK. If you do not have a Lokad login, you may get one by registering for an account here. If you check the box to “remember” your login and password, you can clear it by clicking on the Reset Login button that will appear on the main dialog and then continuing as normal. Once you create your next forecast, the login page will appear where you can enter your information. The forecast will be generated based upon the processing time selected in step #3. Once the forecast has been completed, Strata will add the table to your project and, if desired, open the table for your review.